How To Easily Install A Protect America Security System? 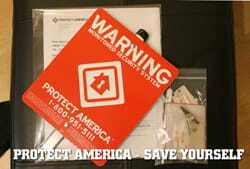 Looking to see how easy the Protect America self install process is? Well I have first hand experience and want to share it with you. I finally bit the bullet and got a Protect America security system in 2012 and haven’t looked back ever since. And since it was such a pleasant experience, I wanted to share the process with you. In order to conduct a thorough review, we ask merchants for equipment to test. 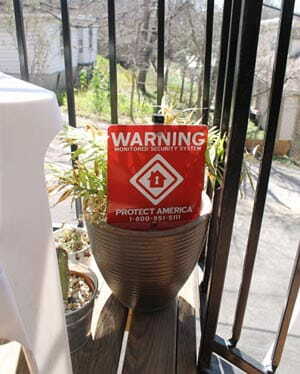 Protect America provided me with a security system, however these thoughts and opinions are my own. Sure I’ve had “security systems” before (aka guards who sleep on the job, and fences that burglars climb over) but never one that makes me feel actually secure – which is their job after all isn’t it? As a female who rents and has never owned much I deemed valuable (or stealable), I never saw the point in security systems. I always thought they were either too difficult to set up or not a part of my responsibility as a renter. Well luckily, I’ve come to find out recently that technology and companies have improved the home alarm industry and installing a security system is about ten times easier than moving is. Check out our annual best home security systems rankings if you want to read more information on home alarm systems. Moving Frequently? Not a Problem! Having lived in 6 apartments in the past 6 years – and that’s not counting the 3 places I lived in college for 4 years. Needless to say, I’ve had many addresses, but none that have had a home alarm system. And, I’ve had my share of security scares: from a broken glass window above my bed in a downtown condo, to people passing out on my doorstep, to bike theft. It’s all a part of “urban living” I told myself. But about half of the places I’ve lived in, I’ve lived in alone. And it’s kind of scary to think about the fact that so many instances could have been prevented with the right home security system. In addition to protecting your possessions, it’s equally, if not more important, to protect yourself. This comes in the form of a smoke and/or carbon monoxide detector. Again, I always relied on others to provide this safety feature that I thought came with my rent (as by law landlords are required in most states to provide and maintain smoke detectors). I of all people should know better too since my newlywed parent’s house burned down when I was only 1 year old. I also have experienced house fires more recently including a neighbors. So more than ever it has hit home to me the importance of having a device that can minimize and maybe even prevent catastrophic situations. I ordered and self-installed the whole system in less than an hour – TOTAL. That’s 60 minutes that could have saved my life, multiple times over. And its all so easy to transport, I don’t have to worry about where I’m going to move next. Its only been a day but I can’t tell you how happy and protected I feel when I hear that “beep beep” sound every time I enter my apartment. Crazy how one little sound makes me feel so secure because I now have the confidence that a legitimate company and service is watching over me, my family, my memories and my possessions. I ordered the alarm system on a Friday afternoon – they asked me a few questions about what type of living situation I have and what concerns I have as far as protecting my home (apartment in my case). In less than 5 minutes, I was good to go and anxiously awaited my home security system to arrive. They said it should arrive in 2-3 business days. They even asked if someone should sign for the package – which seems ironic that someone would steal a home alarm system but no doubt they said it happens. And since we already have a history with theft at our apartment complex, I made sure to take advantage of this extra precaution and nice feature. On Monday morning I got a knock on the door and voila, like magic, my Protect America Box was here! Granted it was being shipped from here in Austin where I live, but still I was super impressed with the promptness and speed of the delivery. I was so excited to start setting it up that I waited no time at all. I opened the box of goodies and started digging into the setup process. The box was not only good looking and branded on the outside, but was just as great inside with helpful instructions clearly marked on what to do next. Upon popping out the cardboard, I discovered all of the components neatly organized with protective coverings and padding. I took everything out of the packaging and put out all the components out on the table before calling them to begin set up – but it turned out to be a good tip that saved us a lot of time in the long run in the install process. And, I know for many it’s tempting to go ahead and start figuring it out yourself, but leave it to the experts to tell you what to do with what. Whenever you are ready, give Protect America a call on the number listed on the box and you’ll be good to go in no time. Tiffany who helped me out was super helpful, patient and walked me through the process step by step, tested the system and then answered all my questions and made sure I had everything I needed. Here is a video of how the process went – all in all we were set up and running in 40 minutes flat. It sounds like a long time, but it went by so quickly. (Note: The industry average time is 16 minutes for men and 12 for women). Note: During set up you will be asked to enter the pin “1234” which is the default. This is not a recommended security pin and should be changed to something safe yet easy for you to remember. I really can’t believe how easy setting up my security system was. Even my husband was impressed I did it with out his help or with out a professional installer. I love the fact that you don’t have to wait around for someone to come out to your home and do it for you – simply set up the alarm system whenever it’s convenient for you. And big props to Protect America for taking the time to make sure all my equipment worked and for putting labels on everything to make the process as seamless and fool proof as possible. And if things couldn’t get any better, they also have an app to not only arm and disarm your system remotely but to also see a history of your sensors. And, if you have a security camera, you can view it from your smart phone. Crazy I know, I couldn’t believe it either. This feature comes in handy whenever you might need to let someone in like a pet sitter or housekeeper. It’s also nice to keep an eye on the status of everything while you are away. You can even set up email alerts for every time the system is armed or disarmed. With multiple ways to monitor your home, you will feel extra secure and safe. Experience with Self Installing Home Security Systems? No one is going to mess with me now. Now, more than ever, I feel so protected and safe knowing that I have a home security system. As they say down here in Austin, don’t mess with Texas. And, for fellow renters, be sure to check out this useful article on security systems for apartments. Have you self-installed a home security system before? What home alarm company did you choose and why? What was the install process like? How long did it take you? Let us know by commenting below.